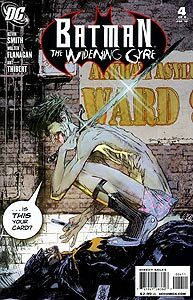 Cover Description: The Joker, dressed only in boxer shorts and high heels, threateningly crouches over a supine Batman. 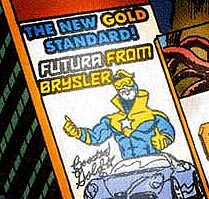 PRODUCT PLACEMENT: Booster Gold appears in an illuminated advertisement for Brysler Motors high on a building in Gotham City's famous Gotham Square. Booster is wearing his Mark I power-suit (in exactly the same pose as his 2009 DC Direct: Justice League International Series 2 action figure). Specifically, the advertisement is promoting the Brysler Futura. Perhaps not so coincidentally, the Lincoln Futura concept car was the basis for the 1960's television show Batmobile, though the car in this ad appears nothing like either that automobile or the Brysler-Booster Mark IV of the late 1980s. This is the only appearance of Booster Gold in this issue.